Me and Luci D. Dream. 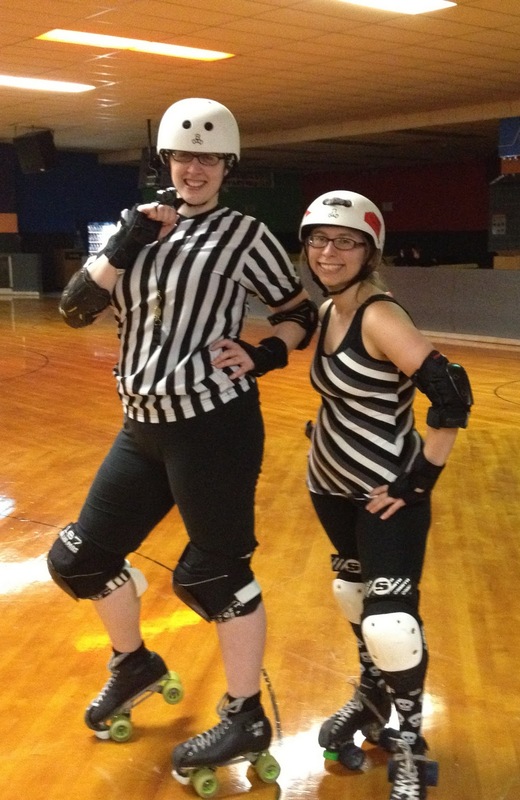 A couple weeks ago we hosted a Sunday night "meat grinder" scrimmage for our newer girls and who took on the Hudson Valley Horrors' newbies. Veteran skaters were invited to watch, NSO, or just help out in some way... I figured this would be a great night to try refereeing! 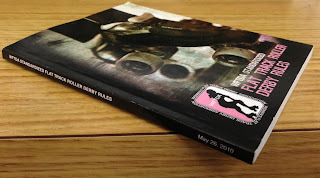 In the beginning of the year, I talked about my roller goals for 2011. Goal #10: Start learning how to referee. A quick note: I was thinking of making my ref name "Bad Temper" instead of Short Temper.. hmm? huh? huh? hahaha. And holy cow there is so much to learn! On Sunday I played worked functioned (?) as an outside pack ref (OPR). I learned how to rotate around the outside of the track with the other two (three total) OPRs. I never paid much attention to how OPRs rotate around the track, but trying it myself was enlightening. So, first I had to get the rotation down, then next was learning where to look in the pack. As you skate along with the pack on the outside, first they are approaching you, so you watch the front; then they catch up to you so you watch the middle; then as you end your half track rotation (slowing down) you watch the back of the pack. AND, if there's a jammer in the pack, you really got watch them cause who knows what hijinx they will try to pull. I should know. There's SO MUCH to pay attention to when you are refing. It was so hard for me to spot penalties, but I did make one call - I think it was a major cut. I called it out at the same exact time as Luci D. Dream, who I was shadowing. But yeah - it's like my brain was working a lot slower than my eyes, and my mouth was working even slower. If I though I saw a penalty, first I would have to think - ok, was that really a penalty? Then I would have to remember who to call it correct - *whistle* Color - Number - Penalty *MAJOR*... which is just so many steps and words and ahhh. By the time I thought I was ready to call something, it was like 20 seconds later - too little too late. And then if it's a minor penalty there's no whistle, just color/number/penalty ... and by the time I thought I was ready to shout something out, another ref would've already called it. Then there's remembering to alert the penalty board person of the minor penalty you caught. Sorry - that was probably a lot of rubbish to people who don't know anything about derby, but I hope any refs reading this will either sympathize with my plight or at least get a laugh. I would love to try refing again and want to learn more and more. I'm def on the look out for opportunities! It's time again for me to whip out my rule book - it's been a while since I went through it...and now I can look at it from a ref perspective too. Speaking of all this too - Flexi Wheeler recently jumped into the fray of refing too. Special thank you to Luci D. Dream for letting me shadow her during the scrimmage. She was an awesome teacher and gave me a great beginner run down. Lastly, a request for all you refs out there: I don't want to seem like just another n00b player trying to figure out refing. Do you have any recommendations for attacking the rules? Where should I focus most first? Sometimes I sneak around the public area of zebrahuddle.com - but jeez, some of that sh*t is over my head. 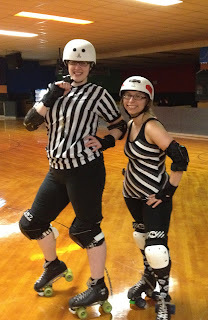 I also just started poking around the WFTDA Officiating section -- wow! Resources and information I never knew existed.